Red started shooting earlier this week in Toronto, and now the first photos from the set of Robert Schwentke’s film based on the Wildstorm comic have got onto the web and MTV found them over on The HSX Dude. 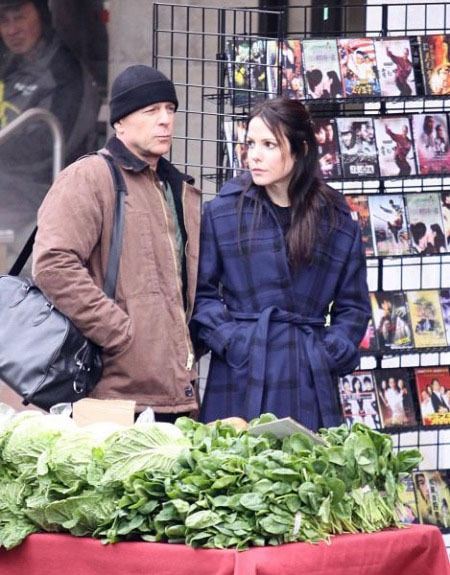 The photos show Bruce Willis and Mary-Louise Parker, and show how the adaptation of Warren Ellis and Cully Hamner’s miniseries will look when it arrives on screen on 22nd October. The comic followed a former black-ops CIA agent forced out of retirement to stop a high-tech assassin and discover who ordered his assassination. Previously, Schwentke told MTV News the film would be a “funny” take on the dark thriller. Ellis has since offered up his thoughts on why the changes were necessary. Helen Mirren with a sniper rifle was a big part of that! Along with Willis and Parker the film also stars John Malkovich, Morgan Freeman, James Remar, Helen Mirren, Julian McMahon, Ernest Borgine, Richard Dreyfuss and Brian Cox. What do you think of the photos? Lots of hats for Willis by the look of it. Principal photography has begun in Toronto on Summit Entertainment’s spy-thriller “Red,” based on the DC Comics graphic novel of the same name by Warren Ellis and Cully Hamner. Joining previously announced stars Bruce Willis, Mary-Louise Parker and Academy Award®-winners Helen Mirren and Morgan Freeman, are two-time Academy Award®-nominee John Malkovich, Karl Urban, Brian Cox, Academy Award®-winners Richard Dreyfuss and Ernest Borgnine, Julian McMahon, James Remar and Rebecca Pidgeon. Directed by Robert Schwentke (”The Time Traveler’s Wife,” “Flightplan”) from a screenplay by Jon Hoeber and Erich Hoeber (”Whiteout”), the film is produced by di Bonaventura Pictures’ Lorenzo di Bonaventura and Mark Vahradian (”Salt,” “Transformers,” “Transformers: Revenge of the Fallen”). 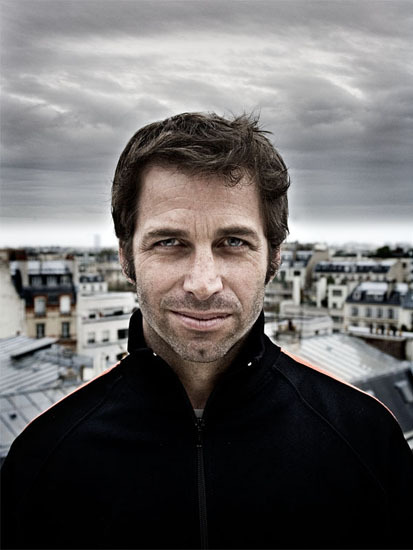 Executive producers are Jake Myers (”Shanghai,” “Hollywoodland”) and Gregory Noveck (”Jonah Hex”). Di Bonaventura Pictures’ production executive David Ready serves as co-producer. “Red” will film in and around the Toronto metropolitan area for nine weeks before moving on to the road and ending in New Orleans in late March for the final two weeks of principal photography. The film is scheduled for worldwide release on October 22, 2010. John Malkovich has signed to star opposite Bruce Willis in Red, Summit’s all-star adaptation of the Wildstorm/DC Comics Warren Ellis miniseries being directed by Robert Schwenke according to THR. 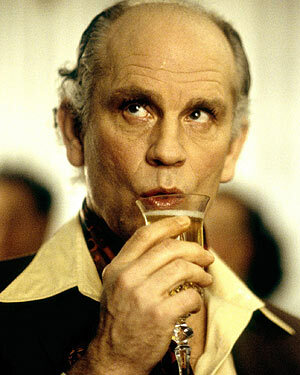 Malkovich is stepping in for John C. Reilly, who exited the role in late December. “Red” is the tale of a retired black-ops agent (Willis) who must contend with younger, more high-tech assassins who show up to kill him. The part will allow Malkovich to exercise his comic sensibilities as he plays retired a CIA agent, a contemporary of Willis’, who is erratic and paranoid that everyone is out to kill him and joins Willis in is quest to find out who wants them dead. Malkovich joins the killer cast that includes Morgan Freeman, Helen Mirren, Mary-Louise Parker, Julian McMahon, Richard Dreyfuss, Ernest Borgnine and Brian Cox. Principal photography begins this week in Toronto. BadTaste.it is reporting that John Malkovich is still in the running to play The Vulture in Spider-Man 4. Malkovich in two comic book movies? What are the chances. The Spidey one could still change as last we heard Sam Raimi was in serious discussions with the studio over the script and villains for the sequel. 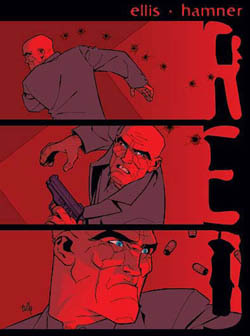 Warren Ellis is the writer behind many great comic books (Transmetropolitan, Black Summer, Freak Angels, NextWave, The Authority, Global Frequency, Gravel, and many more) including the mini-series Red with Cully Hamner. Paul Moses is a retired Agent of the CIA, formerly working in “foreign acquisitions”. Living in a secluded area, his human contacts are limited to pleasant phone calls to his handler (who desires what she believes to have been Moses’ type of work) and letters to his niece that lives in England. Michael Beesley, the newly politically appointed Director of the CIA, is taken to Room R as part of his initiation, where he learns of Moses’ existence and the full extent of his activities. Disgusted by what he has seen, and fearing public reaction should any of those secrets leak out, he orders the assassination of Moses. A three man hit-team is sent to Moses’ residence, and he kills them, recognizing the pattern of the attack and realizing his death has been sanctioned. He calls his handler only to learn that she has been transferred. He informs the Agency that his status has changed from Green to Red before leaving his house and going on the hunt. As previously reported it is being turned into a film and so far all we know is that Bruce Willis will play the lead and many other big names are involved. RED, the book, is 66 pages long. If you were to film 66 pages of comics, you might, might just about get 40 minutes of film out of it. If you added a musical number. The comics-page to film-minute ratio is pretty bad. A straight adaptation of a 150-page graphic novel might, if you squint at it, get you a 100-minute film. But it’s unlikely, because comics and films use time so differently. The mini-series reads very much like a prologue to a much bigger story so this should work out quite well. This also means that there will have to be a lot more characters than a handful in the comic book. What does Ellis think about the actual film itself? Works for me. Are you looking forward to the adaption? John C. Reilly (Walk Hard, Step-Brothers) and Mary-Louise Parker (Weeds) are in negotiations to join the cast of Red, Summit’s adaptation of the Warren Ellis Wildstorm/DC Comics miniseries being directed by Robert Schwentke (The Time Traveller’s Wife). The movie is described by Heat Vision blog as a tale of a former black-ops agent (Bruce Willis), now in retirement, who has to contend with younger, more high-tech assassins who show up to kill him. Reilly would play a retired CIA agent who is paranoid that everyone is out to kill him. Parker would play the romantic interest, a federal pension worker who becomes embroiled in the Willis character’s struggle to stay alive. Morgan Freeman and Helen Mirren are also starring in it. 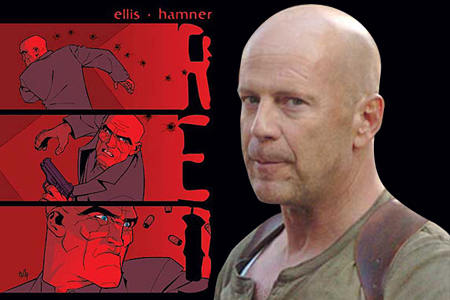 Screen Daily recently had some news on the films that are looking for distribution at the upcoming American Film Market in Los Angeles this week, and it revealed that Helen Mirren has joined the cast of Red, the adaption of the Warren Ellis comic. There hasn’t been much news about this film since it was announced that Robert Schwentke would direct the film, but now Mirren will join Bruce Willis and Morgan Freeman in the film. Willis will play Paul Moses, a retired CIA agent who has a hit put out on him by the new CIA chief (Freeman) to tie up loose ends. It wasn’t immediately clear who Mirren would portray. The film is set to start filming on 11 January 2010, with a release date set for 19 November 2010. Hundreds of riders of classic Vespa and Lambretta scooters are needed as extras for a big screen remake of the movie Brighton Rock directed by Rowan Joffe. The film, based on Graham Greene’s 1939 novel and featuring Dame Helen Mirren, will be set in 1964. According to the BBC Dunkirk Extras has appealed for more than 200 riders of scooters for filming in Brighton and Eastbourne. Nick Robins, of London-based Bar Italia Scooter Club, has been given the task of tracking down the scooter owners. Brighton Rock tells the story of teenager Pinkie, who seduces a young waitress after she stumbles on evidence linking him and his gang to a revenge killing he committed. The original 1947 movie starred Richard Attenborough in the lead role. Oscar-winning actress Helen Mirren will star as Ida Arnold alongside Bafta-nominated actor Sam Riley playing the lead character Pinkie Brown. Pete Postlethwaite and Happy Go Lucky’s Andrea Riseborough will also star in the remake. The film is being made by Kudos Productions in association with BBC Films and is scheduled for national release. Film extras for ‘Brighton Rock’. picked by phone and give more details. from 1964. Please also let us know general availability. This is a fantastic review by Don Fishies. Congressman Stephen Collins (Ben Affleck) is helping with the government investigation of a shady military-based company when he receives word that his mistress has committed suicide. Visually distraught, he leaves a hearing in tears and sets off a media circus. 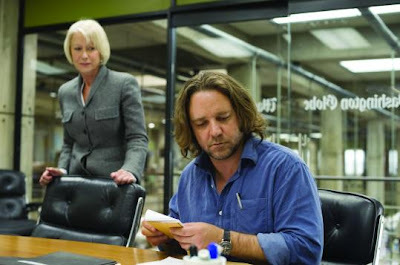 Seasoned reporter Cal McAffrey (Russell Crowe) was his roommate in college, and the two have remained friends. In a bid to quash the political blogging of junior reporter Della Frye (Rachel McAdams), McAffrey sets out to find the truth about the story. State of Play sets itself up early on to be a cookie-cutter, predictable thriller. But as the film progresses, it rather quickly becomes the twisty and conniving thriller it needs to be. Despite being heavily dialogue driven, the film is an intense ride that will keep people on edge throughout. Some scenes are downright terrifying in their amped up suspense and political intrigue. This film really set out to be tense, and succeeds wonderfully. It knows just what punches to pull, and when to pull them. The script, written by political scribes Matthew Michael Carnahan, Tony Gilory and Billy Ray, is insight and intriguing. It could have easily been made boring and inundated with rehashed politicalisms (like all of their last films), but this film revels in how interesting it becomes. It has laughs strung throughout (a genuine surprise), and lacks the nerve to become loaded to the brim with facts and innuendos. Instead, it expertly weaves between scenes, amping up the intensity of some scenes, and downplaying others. But this is mainly due to the incredible performances by the cast. Crowe (who I usually loathe) and Affleck are simply outstanding in their roles. Age issues aside, both play their character with finesse and charisma. Affleck looks and acts like a confused wet-behind-the-ears, gunning-for-higher-office political pawn from beginning to end. Some of the reactions on his face are downright devastating in how excellently they are conveyed. And this is a guy critics once said could not act. Coupled with one-two shot of acting in Hollywoodland and directing Gone Baby Gone, we may be seeing a renewed resonance and importance for the Oscar-winner. Crowe on the other hand, delivers his strongest performance in years. While he has been downplayed and underused in his last few films, he carries this film. He is stubborn and vaguely likable, but he makes his character work for all of his idiosyncrasies and ethically-questionable tactics. He makes a seasoned journalist look like an amateur. McAdams, all but a ghost recently, holds her own against the two heavy-hitters and delivers a performance that is both inspired and emotional. It gives her a lot of room to act, and she delivers in every instance. The rest of the cast is a bit mixed however, as so little of them is given that much to do. Harry Lennix, Robin Wright Penn, Jeff Daniels, the horrifying Michael Berresse and especially Jason Bateman, all deliver noteworthy performances, but never get to really shine in them. They all have their traits and motivations, but get little screen time to truly express them. They each are developed quite strongly, but they lack the movement afforded to Crowe, Affleck and McAdams. I simply loved Helen Mirren’s scenery-gauging editor and all of her subtleties. But she too, is downplayed to the point of almost barely being in the film. Despite its intensity, the film is bogged down by its dialogue-heavy scenes and consistent character additions. It is easy to keep track of everyone, but so many people are introduced that the film loses its focus on more than one occasion. It makes for a few scenes that are merely filler between the scenes of useful heavy acting. It just feels so tiring. I understand now how daunting a task it must have been to convert six hours of British television into a 127-minute film, but there are scenes that are just too easy to not have been cut out (some entire mildly useful subplots may have helped). Adding characters in makes sense for a story about two journalists frantically searching to lift the lid on a story, but there needs to be more emphasis on what was needed and not needed. A brilliant montage in the middle of the film goes almost entirely to waste because the filmmakers lack the knowledge of what should be cut. Limiting the preposterous and silly climax could have also done wonders. The scenes that are left in the film (including the finale) are great, but they could have been stronger if they were as tightly wound as the film wants itself to be. A little less shaky hand camera movement could have also significantly benefited the film. Even with its problems, it is clear from the on-set of the first shot in the bullpen at the Washington Globe that the filmmakers are going for a very keen sense of homage to All the President’s Men. While the on-going and very professional relationship between McAffrey and Frye is very similar to Woodward and Bernstein, the fabric of journalistic integrity and researching are the core of State of Play. The film is loaded with allusions to the Oscar-winning film, and even mimics shots right out of the film. While it is obvious for anyone who has seen Men, this film’s nods are done in such a delicate and unique way that they never become distracting or blatant. The film is its own, and does not ever feel like it is living in its big-brother’s shadow. It is a fresh take on old-fashioned reporting in a very digital age, and frequently walks the tight line of old versus new. 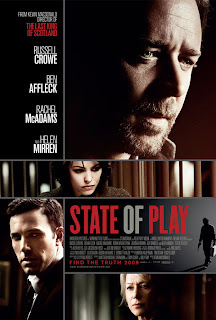 State of Play looked interesting, and surprisingly delivers on almost every count. It is not a perfect film, but it is a solid example of great film-making. It wants to be more, but seems content at being a twisty and suspenseful modern thriller. D.C. reporter Cal McCaffrey has the dubious fortune of both an old friendship with Collins and a ruthless editor, Cameron, who has assigned him to investigate. As he and partner Della try to uncover the killer’s identity, McCaffrey steps into a cover-up that threatens to shake the nation’s power structures. And in a town of spin-doctors and wealthy politicos, he will discover one truth: when billions are at stake, no one’s integrity, love or life is ever safe. Directed by Kevin Macdonald. Starring Russell Crowe, Ben Affleck, Rachel McAdams and Helen Mirren.